The boarding school is housed in the two upper floors of the main school building, in secure accommodation accessed only by the boarding students, boarding staff and appropriate domestic staff. There are separate boys and girls dormitories. Led by a very experienced Head of Boarding, the dedicated and expert boarding team provide a very high level of pastoral care. Boarding plays a crucial and central role within the school, and the provision given to our boarders is extremely important to us. A culture of academic attainment and personal development is nurtured in the boarding school. All students take part in the After School Activity (ASA) programme that runs from Monday to Thursday and the supervised study that follows it. All primary and secondary academic staff are involved in the supervised study every week ensuring that boarding students have access to exemplary academic support. Students may also undertake additional study, either within the dormitory reading rooms or their individual work space in their bedrooms. This also supports the development of our boarding students as self-disciplined, independent and self-motivated learners. Boarding staff act as personal tutors and provide a monitoring and reporting system, both within school and with home. Tutors meet students regularly on an individual basis to discuss their progress and agree a timetable of study. We offer full time boarding with flexibility at the weekend (Friday afternoon – Monday morning) and weekly boarding (Sunday evening to Friday afternoon) to boys and girls from age 8. All of the boarding staff live on the school site and the ratio of students to staff on duty is low. The boarding team includes three fully qualified nurses who are very experienced in boarding and at least one of these is on duty at all times, ensuring exceptional medical and pastoral care. 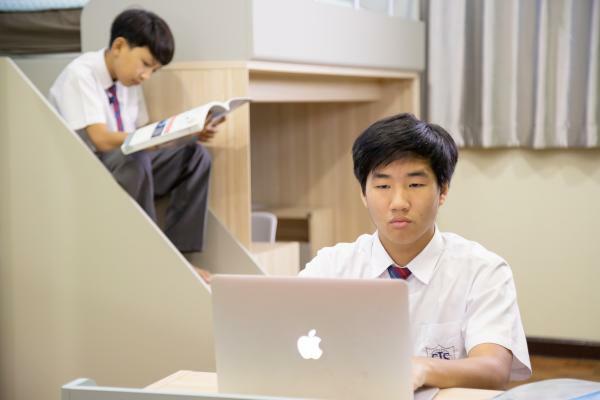 The boy’s boarding house contains eight three bed dormitories for our younger students and eight two bedroom dormitories for our older students. The boys boarding accommodation contains a spacious TV room, a games area and a reading room as well as recently updated shower rooms and restrooms. The girls accommodation is similarly structured to that of the boys.